Paid weekly at $72 for 3 meals for 2 people. 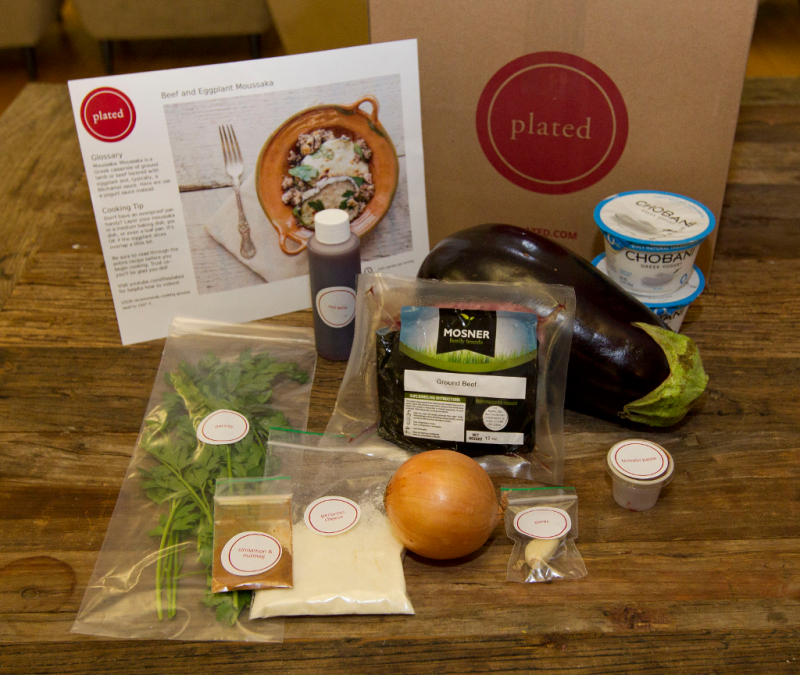 Plated.com launched in 2012 and since then has been delivering dinner kits all over the United States. Every day Plated has at least 14,000 customers in the kitchen using their delivered pre-portion fresh ingredients to make healthy home cooked meals. Plated's fast growth is thanks in part to the publicity of Shark Tanks Kevin O'Leary's investment in the company. Plated is known for the quality of their ingredients, the fruits, vegetables, meats and seafood that go into the meal boxes. Meats from Plated are from animals raised without antibiotics and no added hormones. All fruits and vegetables are fresh and seasonal, and are organic when possible. To keep ingredients fresh, Plated packs up produce and meat that arrived at their facilities on the same day. In a grocery store, on average, produce sits on the shelf for over 5 days, and this does not include the time spent at a wholesaler. Plated has multiple fulfillment and distribution centers across the country which not only helps defray shipping costs but allows delivery of ingredients from regional farmers. Because of Plateds packing and delivery system, they claim food waste is reduced to less than 2 percent. Some grocery stores see waste levels as high as 40% for their perishables. Every week Plated chef's create 9 original recipes (3 of which are vegetarian) that offer great home cooked meals whether you are a new to cooking or an expert. Prep and cook times range for the 7 standard recipes from 20 to 40 minutes and the 2 Chef's Table recipes (which are usually more advanced) at just under an hour. Each of these meals are tailored towards different peoples preferences. This includes omnivores, vegetarians, seafood lovers, and dessert seekers. You will also find meals that are stove top only, low calorie, nut free, and no added Gluten. To place an order just visit Plated.com and click the Sign Up button. The first thing they will ask you is what your delivery zip code is. Once you enter your code you can then move on and see the available subscription plans (the type of plans available and cost are discussed below). After you choose your plan you will then be asked for your address, phone number and any delivery instructions you may have. After that you then choose what day of the week you want your deliveries to happen on. Once all this is done you then need to enter your payment information including a credit card for your subscription. After this you are officially signed up to Plated! Once you are logged in you are then taken to your Taste Profile where you can specify the type of foods you would like (or not) including those with beef, chicken, lamb, and shellfish. You can also specify if you are a vegetarian or not. Examples of dinners include steak sandwiches, tacos, salads, chicken, and fish. You can let Plated choose your meals that they send you based on your taste profile or if you happen to be looking at a the menu for the next week on Plated.com and you see a dinner that you will really like you can also either add that dinner to that weeks box or replace the dinner you where going to get. In the Plated Meal box that gets shipped, you will find all of the fresh ingredients you need to create the recipes that have been chosen by you or automatically based on your food preferences. The ingredients are individually packaged and pre-portioned. Along with each meal you have selected you will find a glossy recipe card that includes step-by-step instructions and photos to how to prep and cook the meal. For your meals there is only a few things Plated assumes you have at home. This includes eggs, salt, pepper, olive oil, and vegetable oil. 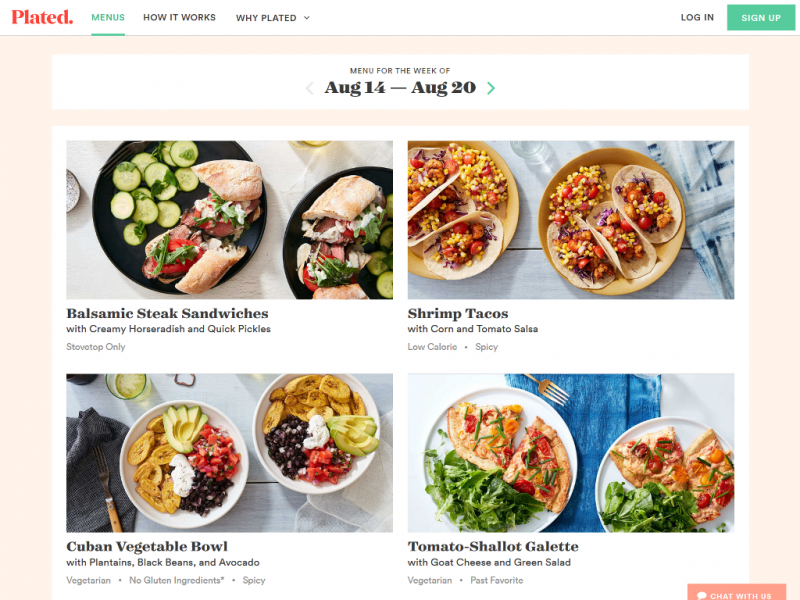 Every week Plated comes out with 7 new and excited recipes which fits a range of tastes, and food choices. These Plated recipes with ingredients cost $12 per meal, per person. Plated also creates 2 additional meals called Chef's Table which are priced individually and include speciality cuts of meat and seafood (based on market price). Plated's 2 weekly dessert options cost $4 per serving and can be added on after your first order. 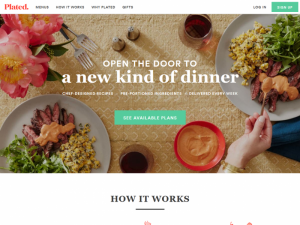 Plated.com offers 3 subscription options. 2, 3, or 4 meals can be purchased for 2 people each week. You can also order multiple meal boxes so it is possible to receive all 7 meals a week for 2 people or, for example order 2 of the same boxes for a family of 4. Shipping is free just as long as your total order is over $50 a week. Weeks can be skipped just as long as you give 6 days notice before your next box is due to ship. You can setup weeks to skip months in advance on your Plated.com user account schedule. You can also cancel your Plated subscription at anytime for no cost by visiting the Subscription tab on your user account page on Plated.com. * Prices based on a weekly subscription. Prices can increase/decrease depending on subscription length. All prices in USD unless specified other wise. Costs and features offered last checked July 09, 2016. Plated delivers across the continental USA (not yet in Hawaii or Alaska). Your meal box is hand-packed and shipped either via local couriers or FedEx and will arrive between 8am and 8pm on the day you specify. No signature is required and the meal box is insulated so the ingredients will stay cold up to midnight on your delivery day. To keep the food fresh during delivery Plated uses a box made from recycled jute plant fiber that can be composted. For items that need to stay cold they are packed with with non-toxic, non-hazardous gel packs. For most locations Plated will delver your package any week day from Tuesday to Friday that you specify. You can skip one or more weeks as needed (for example if you go on vacation), you just need to give them 6 days notice before your next delivery. Scheduling to skip a week can be done via the Plated.com website or the Plated app on the Schedule tab. For deliveries you can also give Plated delivery instructions which they will pass onto the shipper. These instructions can for example ask the driver to leave the box at a neighbours or at the back door, if you are not home. At Plated customer service is important. You can contact them several ways including a toll free phone number, email, and online chat. Customer service is open 7 days a week, 9am to 10pm EST on weekdays and 9am to 5pm EST on weekends. Plated also has a FAQ section which contains many useful articles that answer most common questions. They also have a blog called "The Dish" which contains informative articles about everything cooking. Plated can also be found on Facebook, Twitter, YouTube and Instagram. I have decided to quit getting Plated as it is so hit and miss with them. I was initially very excited to try them and I had wanted a meal service with dessert. Of the 7 meal deliveries we got we had 2 with spoiled items in it and another 1 with a missing item. With a service that is suppose to be convenient, it is super inconvenient to be in the middle of prepping a meal to find the ingredients either missing or spoiled. 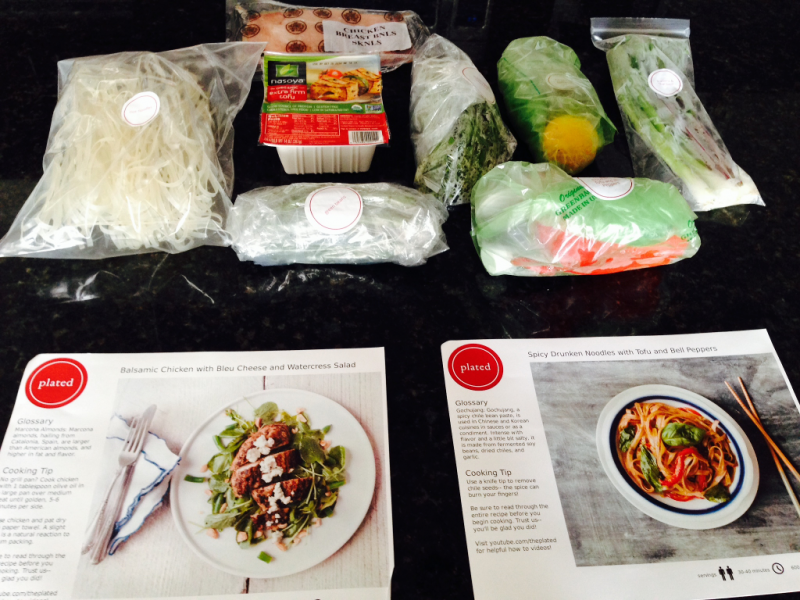 I like the idea of the convenience of recipe boxes but have found Plated to not be good. I am going to give Ble Apron or Home Chef a try next. Food sometimes missing or didn't taste right. Over the 3 months I have had about 10 food deliveries for about 30 different meals so I think I have enough experience to write a review for Plated. Of the big 3 meal services (the others being Hello Fresh and Blue Apron) I found Plated to be cheapest and tastiest. Our family has really enjoyed the different recipes and new food experiences. We haven't had a bad dish yet for a meal. One thing Plated does need to improve upon is their delivery service. Deliveries rarely come between 8am and 8pm with most coming around 10pm which is way to late to use for dinner that day. I also worry about the food being outside for so long even though the packaging is really good at keeping it cold. I have called customer service about this and they said they would speak to the delivery department but we haven't seen any changes yet. No real low calorie options. Need better cuts of steak. Delivers don't always come when they are suppose too.